Everyone turns over 40 years old sooner or later but why must you look that way? 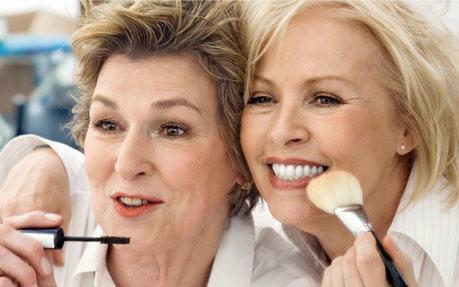 Here are a few great makeup tips for those over 40 but would never admit it. As with all makeup you need to start with great skin. Before you start any makeup application you need to cleanse then moisturize your face. Make sure you moisturize with creams and serums that are rich with retinols, antioxidants and peptides to help wage war on those all tell all fine lines. Also before applying foundation use a silicone rich primer to help create a smoother finish. Makeup for those over 40 means we may need to start wearing foundation to help over up some small problems that have turn up. There are some who skin will never need to foundation but some will. Sun spots are common for those over 40 and a little concealer with foundation will help with that. Start by applying a sheer foundation and apply more light layers of foundation over the areas that need more coverage, then gradually build it up till you have full coverage. You will find that a yellow based foundation works best, but do try to match it to your own personal skin tone. Test on your jaw line in natural light if possible. Don't test it on the back of your hand when trying out foundations, the skin tone won't match and you will find that the color of foundation will be not quite right. If possible look at your skin in a natural lighting to see if the foundation you are thinking of buying looks correctly. Eye shadows that you wore when you were in your 30's just may not be right now. Yet someone had come up with a silly rule that once you hit 40 its time to put away all your favorite vivid greens, purples, pinks eye shadows. Rules are not the same any longer, just change a little. All you need to do is stay away from any eye shadows that are iridescent because they will accentuate any fine lines that you may have. Still, feel the need to wear one of your favorite color of eye shadow that's a bit wild? Do this which is a up date for those who wear makeup over 40. Start with your makeup primer, then apply a neutral color, your browns, beiges, bone then layer over that your favorite I'm not over 40 eye shadow. Best for parties but why not have fun? Don't forget your eyeliner either. Just apply along your lash line then smudge it to help give your lashes a fuller look. Be careful with the color of eyeliner you choose, black may be too harsh for you now. Also don't forget to curl your lashes before applying your mascara as a way to open up your eyes and if you want really long full eye lashes look into Magic Lash Eyelash Enhancer. Just because you have turned over 40 means your makeup doesn't need to change, just change a little. Tone down some colors, you may want to start wearing foundation if you didn't already do so. Start using a cream blush instead of a dry blush, simple things such as that. Drink lots of water and go back to taking on the world at on your terms.